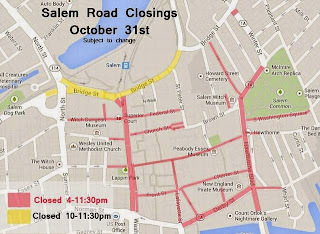 Washington St. from New Derby St. to Bridge St.
Essex St. from Barton Square to Union St.
Derby St. from Lafayette St. to Union St.
Brown St. at New Liberty St.
Lafayette St. from Derby St. to Front St.
Hawthorne Blvd. from Derby St. to Essex St.
Washington Sq. West from Essex St. to Brown St. Washington Sq. South closed. Washington Sq. North closed from Brown to Winter St.
Winter St. at Bridge St. closed to inbound traffic. Williams St. at Bridge St.
Congress St. closed at South Harbor Garage. Vehicles will be detoured to Pickering Way out to Derby St. Derby St. inbound traffic detoured to Wharf St. out to Congress St.
Front St., Charter St., and Central St. closed to traffic. Federal Street closed to traffic from St. Peters St. to North St.
Bridge Street will also be closed at the North Street Overpass through the James Ayube Bypass Road at 10:00 pm through 11:30 pm. Lafayette St. both sides Front St. to Derby St.
Public parking lot along Front St. Public parking spaces located on Central St. in front of old police station. Essex St. from Barton Sq. to Hawthorne Blvd. Derby St. both sides between Union St. and Lafayette St.
Washington St. from New Derby St. to Bridge St. both sides. Washington Sq. North, South, and West both sides. Norman St. from Washington to Crombie St.
New Derby St. between Klop Alley and Lafayette St.
Additionally both sides of Federal St. from Washington St. to the Old Superior Court Building (32 Federal St) and Washington St. in front of 50 Washington St. will be "No Parking - Tow Zone" from 8:00 am until 12:00 am (midnight) on Friday. Help us keep Haunted Happenings safe, contact us at 978-744-1212 with any public safety concerns.